(NaturalNews) A regulatory loophole ushered in an era of toxic pesticides that has destroyed nearly half of all bees and their colonies over the past few years. Thanks to a deeply flawed system in the U.S., with no accountability in sight, the most wealthy corporations in the world are systematically destroying the food supply (while claiming to save it), with GMOs, Roundup and "Neonics" (neonicotinoids), the poisonous class of herbicides that kill "pests" which deplete crop yields and profits for the elitists who manufacture, spread and promote chemical violence in agriculture, and who run Monsanto, Bayer and Syngenta. The EPA doesn't care about the environment or people, as we've seen lately in Flint, Michigan, with the toxic lead-loaded water supply scandal that poisoned children and babies, maiming some for life. The EPA does not subject pesticides to the full set of toxicity tests, and more than 15,000 different toxic pesticides have been approved for the market through one loophole. What's the loophole? The EPA lets the manufacturer simply state that their products are not toxic. The EPA literally enables huge, evil corporations to spread poison across America, as long as they themselves claim "it's safe." Why don't we just let all the criminals in the country be their own judge and jury? It's a rather simple formula for destruction of human and animal life on planet earth: Spray toxic neonics on crops, wait for all the bee colonies to collapse, and end the growth of produce that we all need to survive. Along with birds and bats, bees are pollinators of fruits and vegetables that humans and other animals need for fiber, fuel and medicine. There are over 4,000 wild bee species in North America, all of which are dying from neonics and other chemical-based insecticides and herbicides, because they are never tested for safety by anyone – neither the corporations that make them, nor the U.S. regulatory agencies whose job it is to protect our food, medicine and environment, and whose salaries come directly from taxpaying citizens. Wild bees and honeybees are being virtually wiped out by poisonous neonics that are manufactured to soak into plants, and these bees suffer dementia and immune deficiency (just like humans), as they get sick easily, can't find their home, can't gather and convert nectar, and can't built or maintain their homes (honeycombs). Neonics also leach into surrounding soil, and rain and wind can carry them to farms and streams, rivers and other waterways that lead to neighboring lands. These toxins can remain in the soil for decades, depending on weather conditions. Even the USDA has limited testing run for the dangers of these pesticides being spread all over U.S. soil and crops. The EPA, USDA, FDA and CDC are all paid to look the other way and loosen any legislation that restricts corporate profits. Factoids about bees and toxic pesticides: "Neonics" are 10,000 times more toxic to bees than DDT is to humans. Over 40 percent of all U.S. honey bee colonies collapsed just last year. 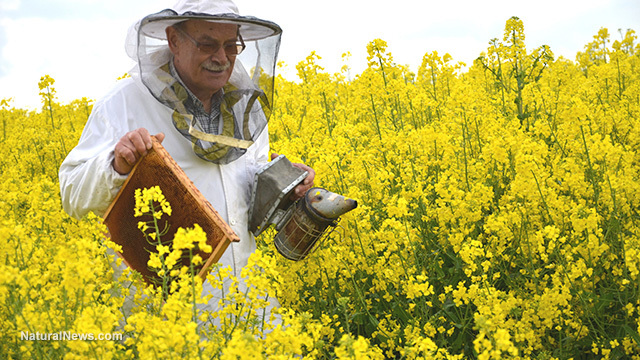 The total number of managed bee colonies in U.S. in 1970 was 4 million; there are only 2.5 million functioning today. Sure, there are other factors that kill bees in nature, like loss of habitat, humans, pathogens, diseases and toxic fertilizers, but the number one cause of the massive bee die-offs, as proven with scientific studies and research the EPA won't conduct, is the class of herbicides called neonicotinoids. We all need to boycott any products sold by these neonics manufacturers, and support alternative news that's blowing the whistle on these environmental disgraces. By not giving these corporations your money, they lose profits and "fall apart" like a house of cards. Be the wisest consumer you know. Monsanto: "The Monsanto company is an agrochemical corporation that is not only the leading producer of genetically modified seeds, but the manufacturer of Roundup, the world's top selling and possibly the most toxic legal herbicide on planet earth–which contains as its primary ingredient-Glyphosate. Monsanto was first to genetically modify plant cells in the early 1980s. They are infamous for manufacturing DDT, PCBs and Agent Orange* (along with Dow Chemical*) – – all deadly combinations of pesticides, including insecticides, that all contribute to cancer, Alzheimer's disease and major malfunctions of the human central nervous system. ... Through a process of mergers and spin-offs, Monsanto has grown its chemical agriculture business into a monopoly, controlling the majority of US crops, seeds and pesticides that are used in conjunction with biotechnology farming agendas, which have been highly DEREGULATED." Bayer: "A German chemical pharmaceutical company specializing in human and veterinary drugs, agricultural chemicals and biotechnology (GMO), Bayer AG was founded back in the 1860s, and was consumed by the Big Pharma conglomerate IG Farben, short for Interessengemeinschaft Farben, during the Nazi reign before and during WWII. After the war, IG Farben was redistributed into smaller (but still enormous) companies, and the German mass murderers who were scientists hired by Hitler to kill millions of Jews and others with noxious gases and sodium fluoride (same kind as in tap water today) – these same scientists were hired, after doing just 4 to 7 years in prison for the war crimes, to create chemical-based food preservatives, chemical pesticides, and later GMO, and Bayer would be one of the top six producers of these cancer-causing herbicides, insecticides and pharmaceutical medications that quell the symptoms of cancer, Alzheimer's and Parkinson's disease."